What's your brother like? To Mao, her brother Fen is someone who would tease her and make her explode 100 times a day; not a peaceful day as the two are fighting every single minute. However, when troubles come, Fen will become a caring, loving brother who protects his little sister at all cost. I thank whatever superior entities exist in this universe for bestowing upon me the good luck of stumbling upon "Take my Brother Away". This is a very short series, each episode lasting 3 minutes. Altogether, this comes to a slightly longer regular episode length. So one can think of it as an OVA. It is so rare these days to find a show based on siblings without there being any semblance of some sort of romantic interest in one another. In other words, siblings being SIBLINGS. It was extremely refreshing. The characters themselves each have their innate personalities, which show up time and again, but not without exceptions, where any change makes perfect sense. Having siblings myself, the dynamics between the two I find quite accurate XD. The art is simple, yet quaint, and entirely endearing. In fact, this was a huge factor into why I enjoyed it so much. Added with wonderful voice talents (Yuuichi Nakamura, Sora Amamiya, god bless you both for your performances T^T) and up beat OST (Brian the Sun!! ), the entire show came together beautifully. I cannot stress enough: if you're in need of comedy, simple slice of life store development and siblings acting like siblings, watch. This. In this anime, you'll find siblings relationship that you can actually relate to, instead of the "imouto" type of characters that go ultra-moe around their "onii-chan". And that isn't the only thing this short anime offers. - The art and animation look fair enough for a short anime. And interesting character designs. - Nakamura Yuichi and Amamiya Sora as two MCs. More than enough for a comedy show. - The color scheme is kinda plain. Make it looks like it's some kind of a flash-animation. - This thing is for fun only so there are no plot to be expected. "What is more important, pride or food!?" My, I'm gonna live by those words. Please Take my Brother Away is a classic sibling war between an annoying older brother and violent little sister - a simple concept well executed in the form of top notch comedic timing, funny character interactions and relatable humor that any sibling themselves can enjoy. To me at least, this is the best comedy of the Spring season and is worth checking out for the concept and low time commitment alone. "Hidden gem" is a term thrown around too loosely these days, but with less than 10k total members for the funniest anime of the season, it certainly applies here. My only real issue is the lack of additional episodes to explore the concept even further, but if more people watch the anime and support the source material then that problem should take care of itself. A final review of Ani ni Tsukeru Kusuri wa Nai! Based from a Chinese manhua, 'Ani ni Tsukeru Kusuri wa Nai!' is a short anime show on Spring 2017 that portrays the typical relationship between siblings named Fen (older brother) and Mao (younger sister) who always engaging this 'sibling fight'. Despite of Fen's mischievous behavior towards her younger sister Mao, he really cares about her sister. Well, not to the point that on that kind of situation that you can be viewed on a typical siscon/incestous anime show *coughs*. Personally-speaking, this anime is a 'hidden-gem' that must be discovered by an anime fan. 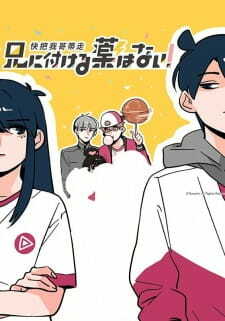 With a touch of comedy, slice-of-life, school genre that gives harmony and balance to the enjoyment factor of the show. Moving on, the plot-line of this show seems very interesting as an anime fan. As I mentioned above, it is a well-balanced show. According to the story of the show, they are poor and Fen (older brother) struggled to manage his responsibilities as an older brother who tend to take care of her younger sister's needs. Even though they fight with each other because of some several reasons, it is somehow shown that they care with each other when someone of them needs a help. There were also comedic scenes like those fights between siblings that are very good, in terms of comedy factor. Some scenarios are also very situational to a scenes with a slice-of-life genre. In terms of technicalities, there were some problems on how they allotted the story because of the limited time and episodes but it is still understable and enjoyable to watch. In terms of art, it is quite good and has this kind of vibe that you can be seen on other chinese-based anime shows. I'm not really familiar on the animation studio named Fanworks who made the animation of this show, but that animation studio (based from MAL database) made also some short anime shows that were also quite good, in terms of art quality. The VAs in this anime show are suprisingly well-casted like Nakamura Yuuichi and Amamiya Sora who were quite popular because of the high quality performance they provided in different anime titles. Furthermore, the opening song from an band/artists named Brian The Sun was also a great choice because they are also quite popular on providing songs on different anime titles. The characters are also well-made and some of them have those kind of 'archetypes' you've encountered on another anime titles. The main characters are quite realistic, specially to their lifestyles. Furthermore, a theory named Individual Psychology by Alfred Adler would also tell the siblings' lifestyle were being influenced by the birth order. In relation to that, Fen (the older brother) tends to have more responsiblity to take care of his younger sister Mao, despite of his mischievous personality/behavior. Mao, who is the younger sister wants to be spoiled on her needs but they are poor, so the responsibilities of Fen became more burden to him. Because of that kind of realistic touch on the personalities of both siblings, the development of the story is also quite interesting. In terms of enjoyment factor, it is very entertaining to an anime fan who enjoys slice-of-life shows. As I've mentioned above, the comedic situation between siblings is quite relatable because of its realistic touch on some scenes. You can also watch this show in one-sitting, so there is no major reason to not be relaxed or enjoyed while watching this show. Overall, this show is really a 'hidden-gem'. Once you've found it, you will discover its greatness. For those who have siblings or even without siblings, you can really watch this just to enjoy the experience of having a close sibling. I really hope that I've encourage someone to watch this show. Also, for those who have already watched this show, please encourage them to watch it.